Warcor to round out the points. - Try to accommodate Rosie and exploit her FDL2. - Weighted towards ARO- protection of the AC2 and going second in BTV. 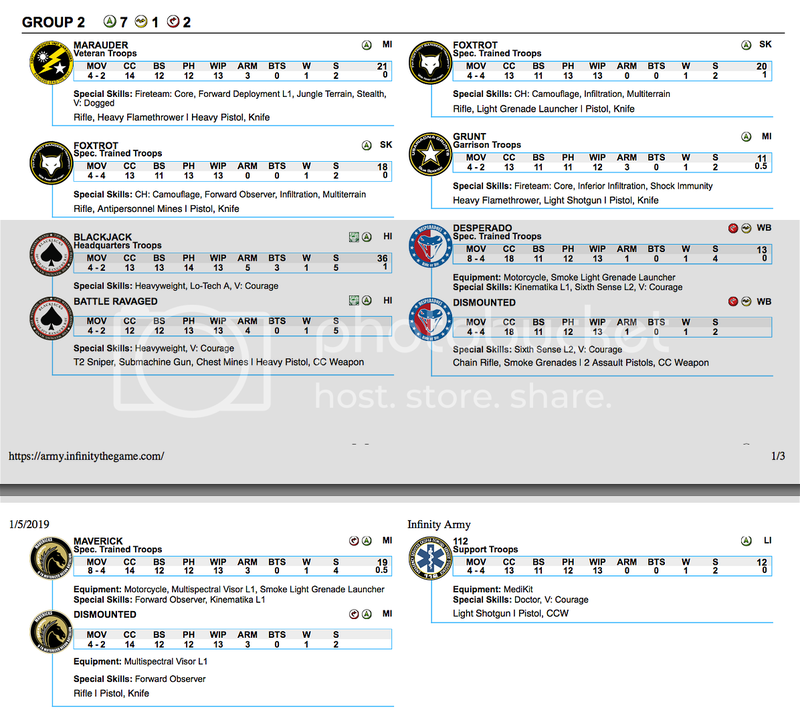 I won the Lieutenant roll off and picked deployment side- making my opponent deploy first. My opponent picked turn order and elected to go first. I picked deployment side because I wanted to the side with the most protected AC2 (blue)- as you will see. The Ariadnas deployed quite aggressively, both Uxia and the Scout making their infiltration rolls- Uxia on the roof top and the Scout practically next to the AC2. The remainder of the Ariadnan force took up covered positions over looking their own AC2. A lone Dog Warrior was positioned for a run up the flank. My deployment was a straight up counter deployment. Recognizing Uxia as the probable threat, I picqueted her with my own Foxtrots. A Desperado with SSL2 stared straight onto the roof edge and also on the other camo markers near the AC2. I waived one of my Marauder’s FDL2 and put him square in front of the AC2 hefting his heavy flamer threateningly. My Grunt castle overlooked the AC2 with exception to the sniper who looked towards the Dog Warrior. My Blackjack T2 sniper also looked down that same alley. After a better look- I realized I could see a Line Kazak too… and I guessed it was probably their Lieutenant. Things went badly for the Ariadnans from the first order. The Dog Warrior ran forward attempting to throw smoke only to lose the face to face to the Grunt Sniper and the Blackjack. Taking a wound from the sniper, he transformed- but much to the surprise of my opponent- T2 blew through the Dog Warrior’s total immunity and knocked him unconscious. Uxia crept to the edge of the building and attempted to smoke the AC2 only to have the HMG and Rosie from the Grunt castle engage her and take her out. One of the Foxtrots also revealed but missed with his pistol, as did the Desperado. The Scout engaged the Desperado who fired back with his assault pistols valiantly but was taken out. Moving forward though, the Scout had exposed himself to the Marauder standing amongst the crates who gleefully flamed him to death. A storm of fire from the Grunt castle also slammed into the twitching body. 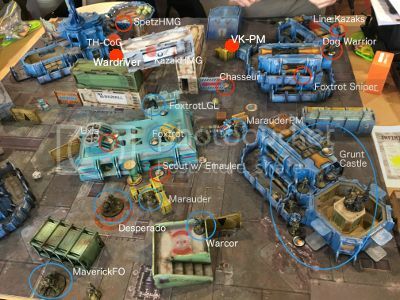 In a chain reaction- the E-mauler went off- isolating the Marauder who glumly spent the rest of the game looking at the smoking corpse of the Scout. 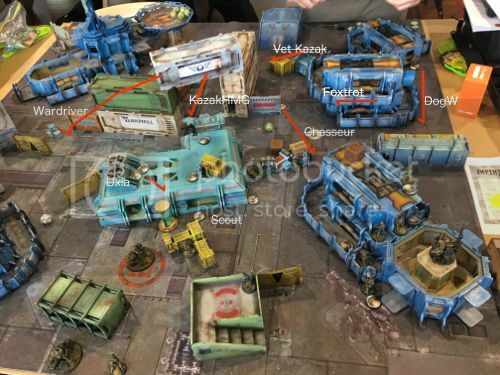 The threat of the Grunt castle was making itself apparent and the line Kazak HMG advanced, gunning down the forward deployed Marauder paramedic. Pushing his luck, (with no cover) he engaged the Grunt HMG who luckily blew him off the table. The Veteran Kazak engaged the Grunt Sniper at long range. Despite losing a face to face and taking a wound, he persisted and the Grunt killed him after several rounds of fire. The Wardriver advanced around a flank and the Chasseur on the opposite flank did the same. The Chasseur tried to access the panoply but unluckily failed his roll. With not a lot of choices left, the Foxtrot sniper surprise shot my own revealed Foxtrot on the rooftop close to my AC2 but who dodged successfully. Luck really wasn’t with the Ariadnans today and not only did he lose the face to face roll, the overwatching Grunt sniper put the Foxtrot sniper down. The luck of the dice was ridiculous- I’ve never had a reactive turn that good. Roaring forward and throwing smoke, my Maverick and remaining Desperado moved up towards the enemy Wardriver taking up position around the central cargo containers. 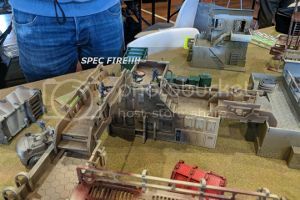 The Desperado charged out of the smoke with double assault pistols blazing and killed the Wardriver who had missed with his shotgun! Having done the hard work- he threw out another smoke grenade- blocking the line of fire from the camouflage marker (Spetz HMG) covering from the landing pad looking through the gap between the central containers. 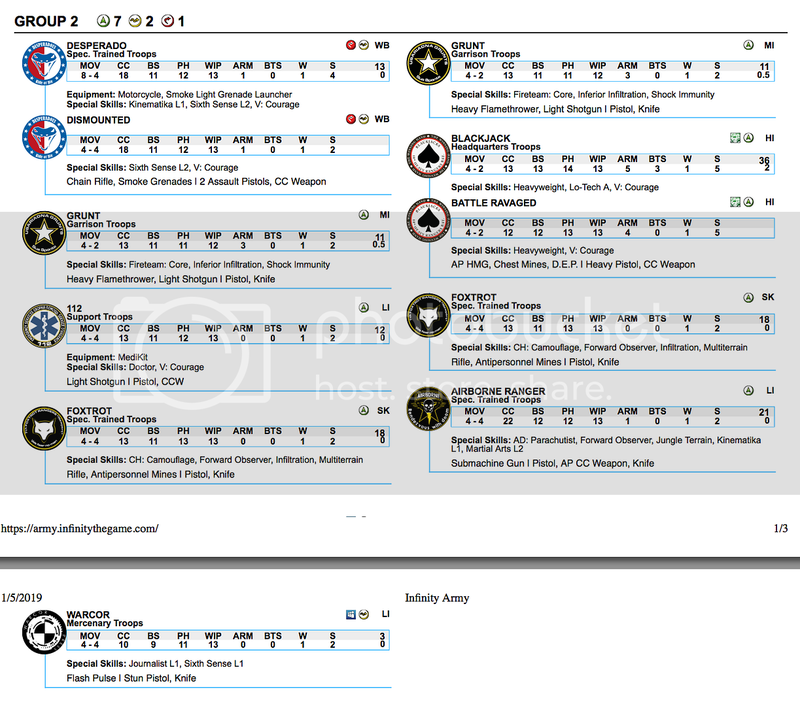 With the Wardriver out of the equation- my Maverick made it to the left most panoply and drew some D-Charges. Running through the smoke laid down by the Desperado, he rode around the side of the containers to shield himself from the landing pad. I advanced my Grunt link slightly forward- engaging the nearby Chasseur and cutting him down with B5 HMG fire. 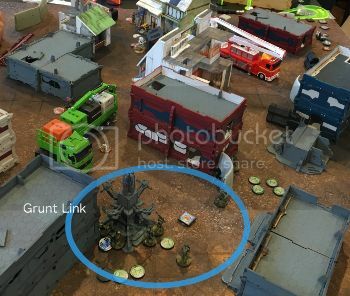 The whole climbing down and moving was quite order intensive and as it was, the Grunt link team made it the edge of their building and took up position to overwatch the camouflage marker on the landing pad for next turn. My Blackjack jumped across to his right and discovered a good line of fire onto a line Kazak facing the wrong way and standing up. Unopposed T2 sniper fire killed him outright. I had just killed their Lieutenant. After such a strong Turn 1, there wasn’t much the Ariadnans could do. The Chain of Command kicked in though and the Spetz HMG moved across the landing pad and engaged the Grunt link several times. Forced to split burst in the face of overwatching Grunt HMG and Grunt sniper fire- the Spetz eventually lost both his face to face rolls and was killed. Now with the Spetz down, my Desperado laid down smoke over the approaches to the AC2- allowing the Maverick to ride in and close combat- laying down D-charges. The first lot of D-charges knocked two STR off the thing, and the second lot of D-Charges finished it off. With the AC2 knocked out- my Desperado raced around the smoke to engage the Tankhunter and was shot down. My Maverick fared better- MSV1 helps!- and killed the Tankhunter. Flushed with the success of the AC2s destruction, the Maverick rode towards the remaining Kazak only to wear a rifle burst from the Line Kazak in the chest and be knocked unconscious. To finish the game off, one my Foxtrots made his way over to the last Kazak (who was facing the wrong way) and shot him in the back. First off- my dice were rolling hot. I had a series of ridiculously good face to face so this win was very much due to that. - need to organize my trays better- had a lot of superfluous figures! - Lucky use of T2 to kill off the Dog Warrior! o future- ?triple ARO threat to Dog Warriors? Nomads won the Lt. order and elected to go first. I picked deployment side and made the Nomads deploy first. The Nomads grouped around their left flank- the Morlock getting 8-4 move on metachemistry and planning on using smoke to cover the advance of the Taskmaster and Zondnautica. The Lizard with its climbing plus camped out behind the central building with the Puppeteer and Krakot. The Taskmaster ML sat on the starting line on the Nomad right. I tried a few silhouettes trying to get a few good ARO positions. 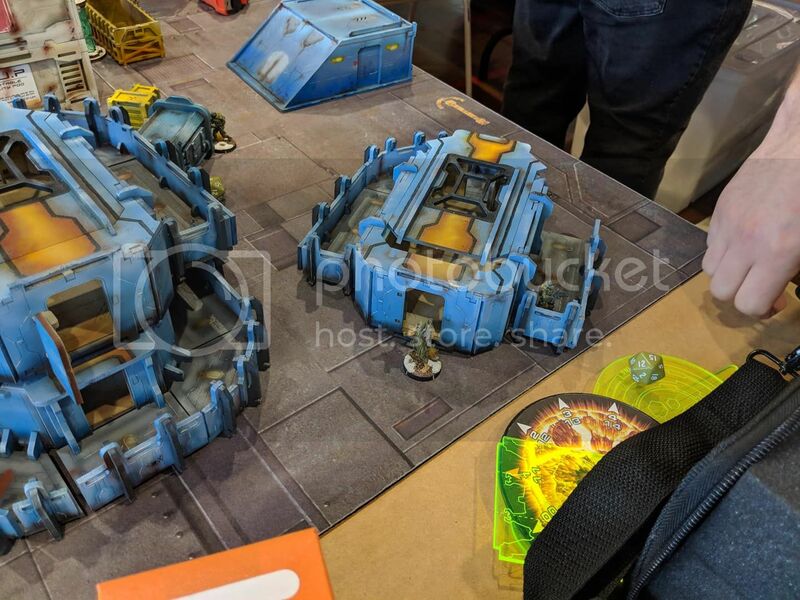 But as it was with the short deployment zones and the tall central buildings I couldn’t get good eyes onto the Nomad starting line. I knew I wanted to be away from the Lizard and I was particularly wary of the Taskmaster ML template. With that in mind- I set up my Grunt castle on my left- with the Warcor and Grunt Sniper on the roof facing down the Taskmaster ML. A HMG looked around the corner at street level and the rest of the team was spread out- wary of the templates. The Forward Deploy special skill for ITS X wasn’t that helpful for the link team as I didn’t want to risk having my link team too spread out and out of coherency. I put my bikes in full cover- hoping to keep the alive to utilize their impetuous orders to get out of the zone. Unsurprisingly, my inferior infiltrating Grunts all failed their rolls but two of my Foxtrots managed to stick their landings. Both Foxtrots who made their rolls were looking down at the Nomad left flank- spying the Zondnautica. Hopefully I would remember to drop mines this time! The Nomads started by smoking up their right flank with the Morlock. One of my Foxtrots revealed and snapped off a shot but rolled a big miss. So much for that ARO! The Krakot raced out of the zone unopposed and hid in total cover by the central building. 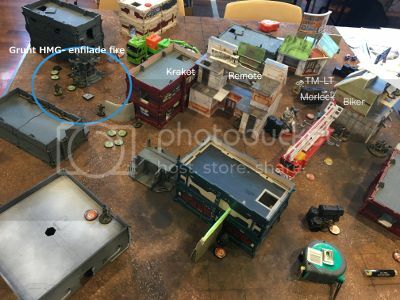 With the smoke down, the Morlock ran forward with his 8-4 move and tanked a shot from the other Foxtrot by the central building. He chain rifled the Foxtrot who luckily shrugged it off. One of the remotes ducked around a corner with its combi rifle and the same Foxtrot gamely shot it down. This Foxtrot was proving to be an issue and the Lizard vaulted onto the roof of his building to get line of sight. He blasted the Foxtrot with multi-HMG and reduced him to pink mist. 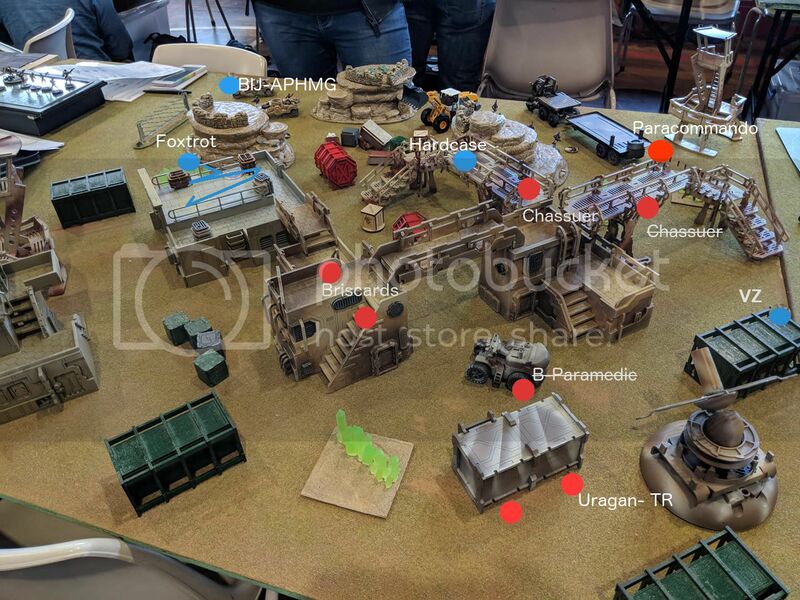 The Lizard advanced out of the Biotechnovore zone, losing a face to face with an overwatching BJ-T2 sniper I had placed on my right flank- but luckily passed his ARM roll. The Taskmaster ML found himself in a trickier spot. Out in the open, he wore the AROs from the Warcor and linked Grunt sniper- taking a wound in his first move despite shooting back. He tried moving again and shooting- but again lost the face to face with the Grunt sniper and went down. Putting a few coordinated orders down, the remainder of the Nomads advanced out of the zone. The Lizard, getting into position close to the fire engine- lobbed a speculative HGL shot amongst the link team that luckily failed to land. Now safe, the Nomads started locking down the approaches. The Lizard, the Zondnautica and Taskmaster LT went into suppression. As the turn ended- the Biotechnovore virus claimed the Puppeteer who was just inside the zone and with that it was down to me. Impetuous orders go first and I staggered my bikes so they were able to smoke the approaches on either side of the fire engine and the suppressive fire Lizard. With that sorted- one of my bikes raced around the rear of the Lizard and blazed away with his double assault pistols. Sadly he missed with most of his shots (on 14s… come on!) and the rest bounced off. Disappointed with his attack- the Desperado continued to make his way around the corner of the fire truck and chain rifled the Morlock and Zondnautica- taking out the ‘rider’. The Morlock tanked his save and chain rifled back, blowing the Desperado away. With my bikers out of trouble, I marched my Grunts out of their castle and up the left flank. And then walking up the side- they noticed they had quite a view down the entire Nomad line. Burning orders- my Grunt HMG got in position behind the broken communication tower and started blazing away. It was carnage as the fully linked HMG cut down every model in sight, in short order. Even the Taskmaster Lieutenant crumpled under the fire. With the last few orders in my second order pool I charged my Blackjack up the table out of the zone. A coordinated order got my Marauder paramedic and Foxtrot LGL out as well. With my turn done, the Biotechnovore virus predictably slew everything left in my deployment zone save for the 112 who miraculously made his BTS save. With only the Lizard left standing, it lobbed another HGL shot at the Grunt link team and scored a hit. Four of the Grunts were hit (including my Lieutenant! Gulp!) and two of them went down. The Lieutenant and HMG luckily survived. 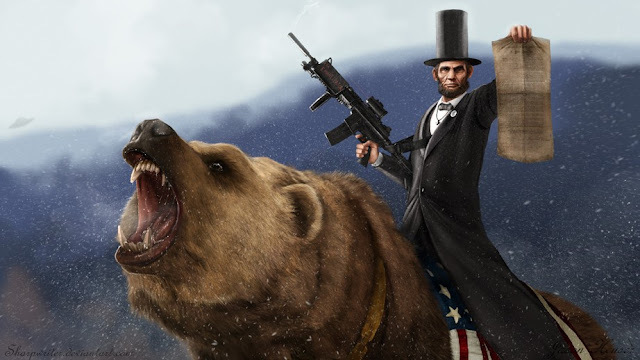 The Lizard went on suppression, daring the circling USAriadnans to engage. I moved my Blackjack into my main group and managed to skirt him around the building to try and get a rear shot on the Lizard. But a combination but 4-2 is slow pace and I still ended up shy of where I needed to get a line of fire. My last Desperado sailed into the Lizard with double assault pistols blazing- and hit once- only to have the TAG punch him to death. I grunted in disgust at these 5 dice shenanigans- Ridiculous! Surviving the virus, the 112 made his way over to a fallen Marauder and revived him, netting me a classified. The Maverick FO- raced up to the Lizard and won the face to face and successfully forward observed it- netting me my second classified. The Lizard burned its orders attempting another Spec-Fire but failed. With that- I looked at my final Classified- Cas-Evac. Didn’t I have to be veteran or elite trooper to do those rescue type moves? I looked at the Grunts- no veterans or elites here. I looked at my opponent who was despondently packing up his unconscious miniatures. I called the game at that point…. I looked up the wiki afterwards- Cas-Evac is any trooper with PH the same or greater than the unconscious model. And being in the opponents half of the table- my Grunt link with it’s unconscious members would have netted me a further 1 Objective Point. It could have been a major… if only I had read up!!! I kick myself!!! The legacy of old ITS seasons would rear it’s ugly head yet again… in a far more ugly fashion…. 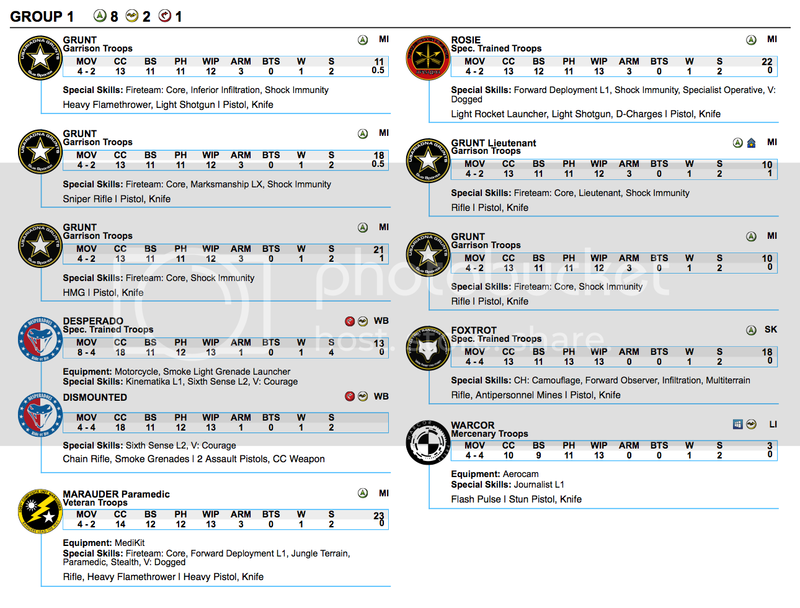 - Know the classified deck for goodness sake! o Looking up the wiki would have taken a minute at most and it ultimately cost me a podium spot! o The BJ-T2 sniper only has an SMG. o I could have 5 diced the Lizard with the Grunt- but I was far too out of position (4-2 MOV with much reduced order pool). o In this engagement- I should have walked the Blackjack into short range with his SMG and cover and gone toe to toe with the Lizard in suppressive. It had the best odds of hurting it (especially since the Grunt HMG was so far out of position). I won the Lt roll and picked the side with the most covered consoles and made MRRF deploy first. The MRRF elected to go first. The French deployment started with a flurry of inferior infiltration rolls- that all failed thank goodness! 4 Metros with inferior infiltration ended up being deployment zone guards- well spread out and protected by terrain- and conveniently stopping any sort of VZ from behind shenanigans. The Briscard link took up position spread amongst the buildings/ walkways and the tractor, utilizing their FDL1 skill to make the best of the terrain. The Urugan (total reaction AP-DA), Minesweeper remote and Dozer hid out in the most protected corner of the field with the Xenotech close by. Finally, a grand total of 6 camouflage markers held a skirmish line in the midfield. Trying to pick which would be mines and which weren’t would be very tricky! I started with my inferior infiltrating Grunts- one failed but one succeeded- landing prone amongst the Briscard link on the building. Hefting his heavy flamer with a big smile on his face. I then counter deployed my Grunt castle to look across field at the Briscards. I could actually see two of the link team- the HRL standing behind the tractor and a prone Briscard just by the stairs of their building. With an open opportunity like this, I put my Grunt HMG and Rosie on overwatch so I would be able to get some double AROs. 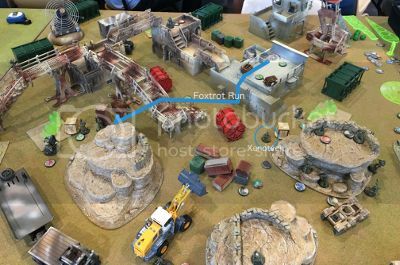 My Foxtrots were on either flank- close to the consoles to get some easy OPs- and my Hardcase and his ambush camouflage I positioned centre on a gantry to clear out the central Chasseur (or was it a mine?). I then placed my picquets- my Minesweeper remote and Desperado shored up my left flank and a Blackjack APHMG solidified my back line (and also had a line to the Briscard sniper to add to the ARO threat). That’s how it started! The Urugan speculatively fired on the Grunt- catching him with the edge of the template on a crit! So much for that! Now with the inferior infiltrating Grunt out of the way the battle quickly turned to the midfield. The Chasseur on my left flank advanced under the gantry and drew a bead on my camouflaged Foxtrot hiding next to a console (out of cover). I didn’t fancy my chances of surviving a surprise shot from camo and cover, so my Foxtrot dropped a mine for area denial. Predictably the Foxtrot was burned to a crisp and to add insult to injury, the Chasseur shrugged off the mine blast with his next move to the console. Luck didn’t go all his way, as he failed the WIP roll on the console with a 17. Contemplating the orders left, the Chasseur walked back and tried again (successfully this time) and he then ducked behind some cover. With that quadrant cleared out- the Paracommando rifle came on- shielded from any AROs by the hills. Then moving methodically, the Paracommando sniped at my Minesweeper REM knocking it out and then picked off my Desperado who failed his smoke roll. He (or was it the Chasseur?) then D-charged a scenery piece to pick up a classified. It was the turn of the other flank now and the other Chasseur crept forward. Shielding himself from the nearby Foxtrot with some terrain he flamed Rosie Munro who was standing over the sandbagged parapet of the Grunt castle. She made her ARM roll handily and blasted him apart with her light shotgun. The Chasseur minelayer on the garage roof close to Rosie attempted a surprise shot- but by nature of starting out of cover and with the bonuses of the 5 man link- Rosie was in a good position to respond. The Chasseur hit with his rifle, but Rosie’s LRL hit better and burned him to death. The overwatching Hardcase elected to reveal in ARO- missed with his shotgun and copped a rifle burst from the Chasseur and a mine to the face which he didn’t survive. The Briscards in their 5 man link found themselves in the unenviable position of facing double AROs. The Briscard link leader escaped down the stairwell with a dodge- winning the face to face. His HRL compatriot behind the tractor though copped a HMG round as the link activated and was taken out. The Briscard sniper stood up and engaged the HMG in response and also lost the face to face- and was killed outright as the Blackjack snapped off a burst. Mindful of the mission- my surviving Foxtrot activated the nearby console and made his way up carefuly onto the garage roof (towards the other quadrant’s console). 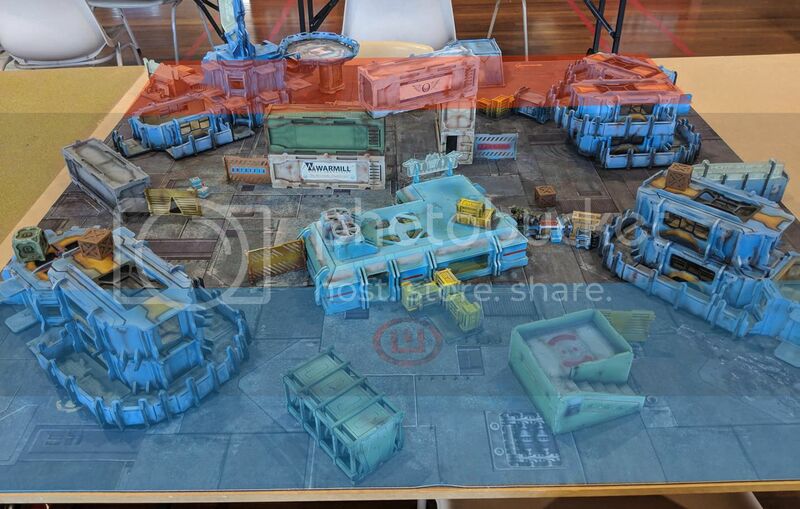 The Dozer and the Xenotech moved into the quadrant controlled by the Grunt castle and placed the multiscanner. With an OP on the board now, I brought on Van Zant behind the green cargo container and shot down the Chasseur on my half of the board (who was facing the wrong way). It wasn’t at great range and the camouflage made a difference! It took several orders to do and with not a lot of orders left, Van Zant then crept forward and gunned down the Briscard paramedic (who was also facing the wrong way). I contemplated ramboing VZ further- challenging the TR Urugan but I didn’t facing losing him- so I just put him in suppression. With two quadrants each- it was 2-2. The MRRF had taken some serious damage but weren’t out of the fight. The Urugan started the exchange by speculative firing onto Van Zant who managed to dodge his way out of the face to faces where the Urugan landed its template. Tiring of that game, the Paracommando moved into a covered position and rained fire down onto Van Zant where he had no cover and put him into a dogged state- doomed to die at the end of the turn. One the Briscards stood up to try and kill my Foxtrot before he could reach the console on the garage roof. A flurry of ARO’s followed from Grunt castle and the Foxtrot- forcing the Briscard to split burst. Rosie- who missed in ARO - was knocked unconscious. The Foxtrot though critted the Briscard with his roll though and knocked the Briscard down. I moved my Foxtrot on the garage roof to the console and made his WIP roll to secure another OP. Now I had to clear out that annoying Paracommando. I had moved my Blackjack into my main pool for this purpose and he slowly made his way into a firing position burning most of his orders to do so…. 4-2MOV is sloooow! There was brief exchange of fire and the Paracommando survived one hit and ducked around the truck trailer he was hiding behind. I burned my last few orders in the main pool, moving the Blackjack into a better position and heavy pistoling the Paracommando to death. I walked on my Airborne ranger over Van Zant’s corpse to try and contest that quadrant (again)- but it wasn’t enough to tip the points into my favour. TWith that done, the remaining Chasseur mine layer, positioned on the central gantry, revealed to shot the Blackjack in the back. A flurry of AROs followed from the Foxtrot and the Grunt castle. When the firing stopped, the Chasseur was dead and the Blackjack was left battle ravaged, but still standing. The French Dozer led his Xenotech into the quadrant they still controlled and placed the multi-scanner for another OP. It was time to maximize points and the last Foxtrot moved over to untouched console on my left and flicked the switch. I had edged ahead on Quadrants these last 2 turns, and with 3 consoles flicked to the MRRF count of 1- I had eeked out a minor victory. Actually it was a major- as my Xenotech should have scored points for the other two rounds he was in my dominated quadrant. But I didn’t read that part carefully and thought it was for the last round only and tallied the points as 7-3. Should have been 9-4. Yes… I’m still kicking myself. o Missed out on 3OPs as my Xenotech was in my dominated quadrant for 3 turns and I only counted the extra point for the last turn. o Zheng/Qi- Foxtrots do the work, Grunt team does the hard distracting. o VZ challenge the Urugan and then get access into the back line to kill the Dozer to slow down the Xenotech? o Consider IDF in list? SP win LT- pick deployment side (best cover) and forcing me to deploy first. Spent far too long on deployment (45min!). Infiltrating Grunts both failed their rolls. When they don’t stick, I know it’s going to be a hard game. Grunt Link- spent heaps of time unable to find a castle and had to test silhouettes around the far containers to make sure no AROs. Designated target placed out in the open (I was unaware that the HVT was in fact a DT). Blackjack placed behind container (not prone)- not that smart a move. Note diagonal lanes of fire cutting access from Blackjack moving up that flank. Entomarchos A- well back and centre. Phoenix covering diagonal approach of the Grunt link. Entomarchos B- back corner- protecting EN Designated Target. Agema- smoke MSV2 ability- sited well back to beyond 32” HMG range and reserve model to counter deploy against my Blackjack. EN DT- intelligently placed in total cover behind the landcrawler. I didn’t read the mission (assumed it was ITS 7) and had placed my HVT out in the open- allowing an easy turn 1 kill and 3 points down. Doubly injurious because if I had read the mission and points scoring, I would have changed my lines of operation- with main effort on the BJ to kill the EN HVT (actually reasonably close)- and with supporting Line of operation of VZ to come on and kill the Agema ML blocking the BJ. As it was I spent all my time chasing Phoenix around with a HMG, losing all my F2F or only winning marginally and having him pass his bloody armour saves. I eventually put a wound on Phoenix but he went into NWI and hid away. My Blackjack found himself badly out of position on that flank. Too far away to get an angle to his nearest target (a Thorakite) and his usual movement hindered by the Agema ML at my bad range. After burning 4 orders, the Blackjack managed to get a bead on the Thorakite but failed to kill him. Failed one F2F and the then the second only landed one hit which the Thorakite shrugged off. The rest of the game was a write off as Hector and Phoenix either smoked their way to safety and then blew apart my army piece meal. With my turn 2 I realized the importance of the EN DT and my Blackjack data tracker having no access to it! With that in mind I brought in Van Zant who killed the Agema (eventually) and took out a Probot. He also put shots onto Hector who passed all his rolls and flopped prone behind the body of the Probot. I should have shot the Probot down and continued to blast Hector- but not thinking smart (I was on tilt) I wasted 2 precious orders skirting VZ around and getting tangled in a firefight with a Myrmidon in cover. (ODD in cover… I’m never going to win on 3 dice). With that wasted opportunity- not being able to put SP into LOL- I compounded it with an order starved, poorly positioned Blackjack managing to target Hector in his back arc and blowing the opportunity. I rolled 3 hits (one a crit!) but Hector handily passed the remainder of his ARM rolls and guts’d away. By this stage I had wasted too much time and after a quick chat with my opponent- we decided she would play her second turn to max out points and then we’d call it there. I took far too long thinking about deployment and we both spent a lot of time deliberating moves. As it was I no chance to pull it back with a Hero run- which to be fair had a very low probability of success anyway. Where do I start with the debrief? Read the bloody mission! And highlight and annotate. - Put the HVT completely out of view on a flank. Always. - This would subsequently heavily influence the EN deployment- may force them more forward and easier to get to??? - Also reading the mission- knocking out the HVT= 3 points- maybe Rosie could have been a better datatracker/ assassinator (FD Level 2). Flows onto whether she should be linked? I’ll talk about this DT killing missions later. - use them and deploy like you’re going to use them. VZ should just shoot robot corpses to get better views onto targets. - 5x 8s of linked HMG is as good as it gets and Phoenix hits on 13s. - Initially I thought 5 dice would compensate- except for when it’s Steel Phalanx and they are opposing with 2! What is the answer to the ODD in cover conundrum (especially when your Grunts don’t stick their inferior infiltration)? 1. AVOID. Don’t waste orders going F2F except under dire circumstances. 2. If you want to F2F- probably put those 5 dice against a Myrmidon chain rifle/ pistol. They will typically smoke. 4. Spend your time taking apart the ARO piece covering the BJ and then hitting the Thorakite. They are ARM 3 but at least don’t have ODD (except for Thrasymedes). In which case, killing two Thorakite by FO/ guided, spec, or direct F2F is priority. So with those initial knee jerk reaction thoughts aside- I’m going to be more systematic in my review of Steel Phalanx in this game. - ODD- unbeatable active and practically unbeatable reactive (when B2)- even with B5. - Thorakite 360 visors- always F2F at B2 (when linked). - High mobility with smoke cover (which will almost always go down). o Should have tried to avoid Phoenix entirely. These probabilities were all determined using the Infinity Dice Calculator (which I am assuming is a validated tool). 5. VZ is a special case… I would rather save VZ for the Thorakite link once one of them has been taken down. - HMG- utlitize terrain to advantage (Thrasmydes has LRL- -3 >24”. Therefore in cover: 2x 8 or 9s (-6), vs 5x 8s. Still risky!!! - Better to chop away at the Thorakite first. MUST KILL 2 Thorakite FIRST to reduced Thrasymedes to B1!!! - only attempt this once those previous LoOs achieved. - PLAY MISSION- read and annotate- max points! - Maneuver and defeat Phoenix entomarchos. I lost the Lieutenant roll off and Nomads elected to go first. 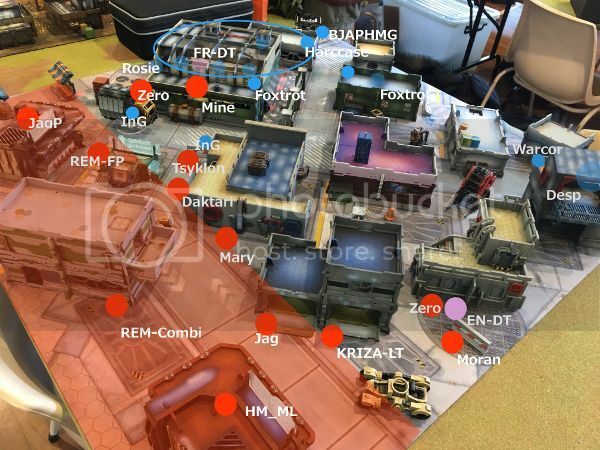 I picked deployment side with the most protected corners and made the Nomads deploy first. The Hollowman missile launcher took up position on the roof of a corner restaurant. The Jaguar Panzerfaust took up position on the other restaurant on the other flank. The Kriza was placed in a position of total cover, whilst the Tsyklon and Mary Problems assumed the centre position. The two Zero minelayers guarded the flanks- one of which was positioned protectively around the Designated target. And finally, a Moran with its Krazy Koalas joined him. Luck went my way and my two infiltrating Grunts made their rolls! One was directly facing the Tsyklon (and Daktari behind it) and the second Grunt landed behind the Hutton delivery truck- squarely facing off the camouflage marker adjacent to the garage. My priority was in deploying my Lieutenant and link team and Designated target completely out of view of the Hollowman. The height of the Warsenal garage would offer a good degree of protection from super-jump ML shots and I hid my link team there. As an added defense against the inevitable air drop, I had my Grunt Lieutenant prone on the roof just behind the garage and assigned him a Hardcase bodyguard. Utilizing the FDL2 skills- I put Rosie of the link team on the corner of the Garage- able to draw lines of fire to the nearby camo marker and the Jaguar panzerfaust (or was it ADHL?). Either way some hard choices were going to be made by the Nomad player. 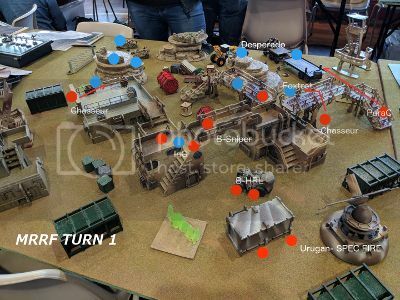 I reinforced the area around my Grunt castle with the rest of my force-including my Blackjack who I made my Data-tracker. 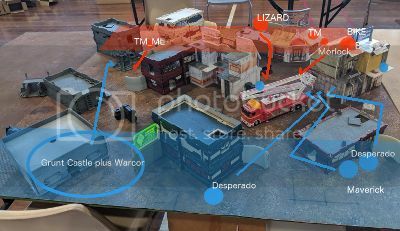 The far flank- I placed the Desperado in total cover- and a Warcor to send out flash pulse AROs. The game started with the Nomads dealing with the infiltrating Grunts. The Jaguar on the rooftop successfully glued the most threatening Grunt but took two hits from Rosie Munro and was burned to death. Thinking a nit more laterally, the nearby flash pulse REM engaged the other Grunt hiding behind the Hutton transport truck but took a pistol shot ARO and was knocked out. Mary Problems took up the mantle and clambered her way to the roof of the old garage and fired down on the Grunt with her SMG. I didn’t fancy my chances of shooting back against ODD in cover and dodged- successfully- back behind the truck and out of view. Now with the Grunt well exposed, the Tsyklon moved into a better position (out of heavy flame thrower range) and critted the Grunt into unconscious. The Zero minelayer facing Rosie’s link team dropped a mine and ducked back out of view, hoping to stymie the future Grunt advance. Unluckily, he was well within 8” and out of cover and Rosie’s unopposed shotgun blasts killed him. The Hollow Man- unable to get a bead on any key USA figures- leapt his way across to a balcony on the central apartment building to get a better ARO position next turn. The Warcor flash pulsed him successfully but the Hollow Man shrugged it off contemptuously. The last REM moved forward and discovered the Hardcase’s ambush camouflage marker I had set up as a decoy. Now preparing for the reactive turn, the Moran set his Koalas to standby mode to protect the Designated Target and took up position to cover a corner. The Hollow Man was out of position and being the key ARO piece of the Nomad force- I made it my priority. Still impetuous orders have to go first and the Desperado sped forward to engage the Moran double assault pistols blazing. (In hindsight he should have triggered the Koalas but we thought they turned into mines!). Either way he lost the face to face despite rolling 5 dice and was knocked unconscious. My Airborne Ranger walked on and fared better- knocking the Moran out. Now it was the turn of Van Zant who walked on behind the red roofed restaurant in the Nomad deployment zone. Sneaking up to the corner- he engaged the Hollow Man who was facing the wrong way. Naturally VZ only hit with one burst and and the now wounded Hollow Man turned around hefting his missile launcher. A few orders and several passed ARM saves later, the Hollow Man dropped unconscious. That was the key moment in the game. After that Van Zant ran amok- gunning down the nearby Jaguar and the Daktari who was facing the wrong way. He then climbed the roof of the restaurant into total cover to threaten the Kriza for the following turn. My Foxtrot in the Warsenal Garage, deducing the camouflage markers around him were mines, MOV-MOV’d to trigger both the mines impeding the Grunt advance and was blown to pieces. Free from AROs, my Grunt link advanced and Rosie fired her LRL at the unconscious Daktari next to the Tsyklon. The Tsyklon failed its dodge against the template splash and was destroyed. 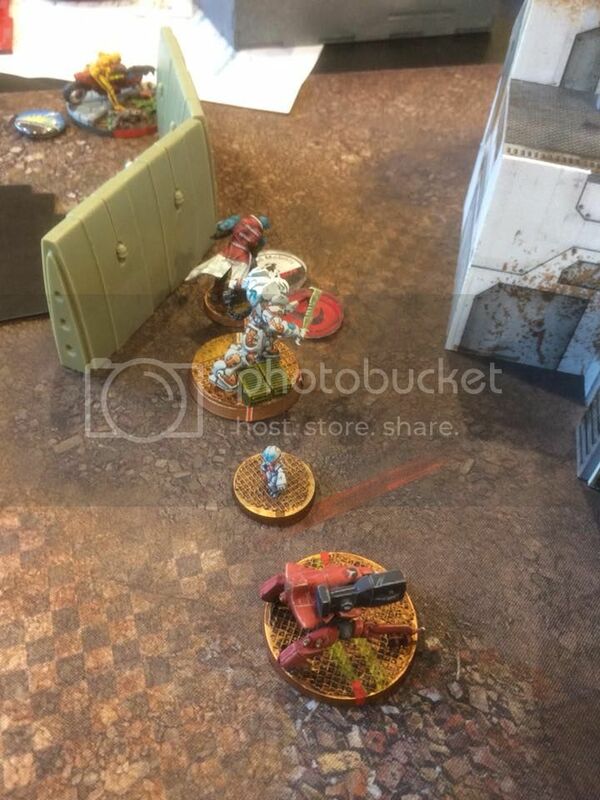 With Mary out of view, the Grunts took up position to around the truck and the Warsenal garage to threaten multiple AROs should she try to advance. The Blackjack moved forward to engage the REM staring down the main street and not only lost the face to face rolls but ended up blinded for it’s troubles. It had been a rough turn 1 for the Nomads and with not a lot left on the table they had few options. Clearly Van Zant was the greatest threat, threatening the Lieutenant and the Designated Target if left unchecked. To stop him, the Tomcat walked on and made his way into Van Zant’s back arc. Utilizing climbing plus, the Tomcat blazed away with his combi-rifle only to miss with every shot! Phew…. Van Zant passed his dodge and turned to face the Tomacat. The next face to face between the two went poorly for the Tomcat and he died to Van Zant’s heavy pistol. The Kriza recognizing the precarious position he was in- ducked into cover by the nearby buggy should Van Zant try to hunt him. Mary Problems tried a long ranged shot through a window at my Designate Target who was able to dodge. A storm of ARO fire from the Grunt link team turned her into pink mist. It was time to assassinate the Kriza. I moved a Foxtrot forward and attempted a surprise Forward Observe (hoping to follow up with an artillery bombardment). Depressingly, I missed with both FO rolls and the Kriza subsequently blew the Foxtrot away on the next attempt. My Airborne ranger took out the last Nomad remote and attempted another FO roll which also failed. He did however pass his ARM roll. It looked like Van Zant would have to be the man of the hour and he stepped up to the plate. It took a fair few orders but VZ eventually put the Kriza Lieutenant down netting me some OPs. I had long since given up on the Blackjack (my datatracker) making it to that side of the board and killing the EN designated target, and so it fell to Van Zant who knocked out the designated target with a flurry of dice. Now moving slightly to draw a line onto the Zero, they engaged each other inconclusively. The Zero engaged Van Zant whose luck held and at the end of the two rounds of fire was still standing (well actually prone on an elevated position). With that out of the way, my Airborne Ranger skirted around the Krazy Koala danger zone and shot the Zero in the back. - FDL2 would also be very helpful but a well positioned EN DT is protected by mines and total cover and often too hard to get to (see game 4). - READ THE VICTORY CONDITIONS!!! - one tray- ONE LIST of S2s? - deployment- takes too long…. · Central tower- I had easy access and then had plunging fire down onto the Thorakite and Thrasymedes. Didn’t use it. § Good in game 5- FD L2 means 24” deployment… great AROs then and she has SSL2. § Opportunity cost… would rather more Desperado’s and maybe a sniper. - When Did I Use Maneuver Warfare Theory effectively? 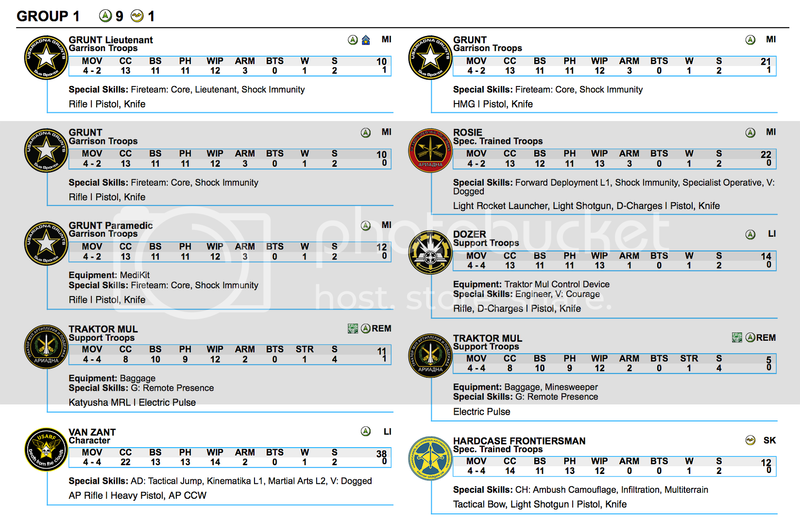 · FDL2 Rosie as ARO on midfield- especially with advanced deployment zones. · Allow link team to skirt and destroy order pool and isolate the COG- effectively neutralizing it. · Splintered efforts- splitting burst to cover multiple AROs. - When Did I use Attritional Warfare theory effectively? § BAD idea vs ODD cover and 2 dice. § Really he’s too slow to get into a good spot to knock out a DT placed by a good player. § Much better used as the stick for TAGs and HI and not much else?? ?